MexConnect.com Forums: Areas: Central Pacific Region: Big blow? How is the weather holding up down there? Are you expecting to feel the effects of Beatriz today or tonight? Hope you all are well prepared & will be safe! This warden message is being issued to alert U.S. citizens residing and traveling in Mexico that the National Hurricane Center (NHC, www.nhc.noaa.gov) forecasts Tropical Storm Beatriz to become a hurricane as it approaches Mexico’s coast. The NHC has issued a hurricane warning for the coast of Mexico from Zihuatanejo northwestward to Cabo Corrientes, with a hurricane watch and tropical storm warning for other parts of Mexico’s western coast. The U.S. Consulate General will continue to monitor Tropical Storm Beatriz and will issue updated messages as necessary. U.S. citizens are urged to locate shelter, monitor media reports, and follow all official instructions. U.S. citizens should carry their travel documents at all times (i.e. U.S. passport, birth certificate, picture ID’s, etc.) or secure them in safe, waterproof locations. We also suggest that U.S. citizens contact friends and family in the United States with updates about their whereabouts. Additional information on this year’s hurricane season can be found at “Travel Alert – Hurricane Season.” Information on hurricanes and storm preparedness may be found on our “Hurricane Season-Know Before You Go” webpage, and on the “Natural Disasters” page of the Bureau of Consular Affairs website. Updated information on travel in Mexico may be obtained from the Department of State by calling 1-888-407-4747 within the United States and Canada, or from overseas, 1-202-501-4444. These numbers are available from 8:00 am to 8:00 p.m., Eastern Time, Monday through Friday (except U.S. federal holidays). Please continue to monitor the Embassy’s website (http://mexico.usembassy.gov) and the Consulate General’s website (http://guadalajara.usconsulate.gov) for updated information. Please consult the Country Specific Information for Mexico, available on the Bureau of Consular Affairs website. The U.S. Consular Agency in Puerto Vallarta is located at Paseo de los Cocoteros #85; Sur Paradise Plaza, Interior Local L-7, Nuevo Vallarta, Nayarit, C.P. 63732. The U.S. Consular Agency in Puerto Vallarta’s telephone numbers are 011 52 322 222 0069 & 011 52 322 223 3301; the fax number is 011 52 322 223 0074. For after-hours emergencies, please call 011 52 33 3268 2145. The U.S. Consulate General in Guadalajara is located at 175 Progreso Street, Col. Americana, Guadalajara, Jalisco, Mexico. The U.S. Consulate General in Guadalajara’s telephone number is 011 52 33 3268 2100; the fax number is 011 52 33 3825 1951. For after-hours emergencies, please call 011 52 33 3268 2145. White caps in the pool? We've been in Barra de Navidad since Saturday. So far it isn't any windier than yesterday and still coming from the north which is the opposite direction Beatriz will be blowing. The surf is pretty small and it hasn't rained at all. Be nice to get some rain. Re: [Bennie García] Big blow? It just now started to rain lightly and a few light gusts of wind. The wind has switched around to the west. Now I have to switch back to basic editor to edit this ????? Heavy rain? It rained lightly for all of 15 minutes. There is a very slight breeze blowing now and no rain.. This makes it look impressive. What a cool image! Thanks for sending the link. Re: [La Isla] Big blow? More impressive than it has been so far. A little rain and some light wind gusts is about all we've had up to now.. No killer storm surf. A few heavy, short lived showers yesterday evening & then it settled into a nice light, but steady rain. It rained all night & is still going on lightly today. The sky is a solid gray.....no wind at all - thus far & by now, I would guess we won't get any. The usual continuous drizzle here with zero wind, it been raining since last night. I've seen this every time a storm passes us by, Kenna only gave us 1" of rain. Hurricane Beatriz is threatening some of Mexico's most popular resorts, leaving tourists sheltering in their hotels. The Pacific ports of Acapulco, Manzanillo and Zihuatanejo are closed. 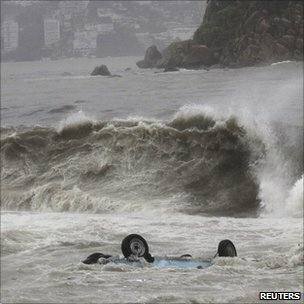 The US National Hurricane Center said winds rose to 150km/h (90mph), with the storm moving over the coast. Early on Tuesday, Beatriz was located about 20km (15 miles) south-east of La Fortuna and 80km (50 miles) west-northwest of Manzanillo, moving northwest at about 20 km/h (13mph). The usual copy and post BS from arbon. When did you last visit Mexico, old pal? You can't even agree with sparks who is across the street, so how can you agree with a reporter over 400 miles away in Acapulco. Stopped raining about noon, nothing since. The pizza place was closed, Scott. What's up with most eateries being closed in Barra on Mondays? We ended up eating at Tinto del Mar. And it rained the whole time we were there. And all night. And on and off all day yesterday.